Between the official arrival of summer and being 9-months pregnant, I’ve been pretty warm when I sleep. I’d like to open half the windows in our room every night, but my husband doesn’t seem to share my sentiments. So I was thrilled when I had the chance to check out the In Balance sheet set from Select Comfort. You may know Select Comfort for their Sleep Number beds, but they also make a wide variety of other bed products including pillows, sheets, blankets, mattress pads and more. The In Balance sheets are constructed out of a 50/50 blend of cotton and Outlast® Adaptive Comfort® Viscose fiber that combine to help balance out temperature swings. The Outlast fabric adapts to your changing thermal needs by absorbing body heat when too much is created and releasing that heat back to you when you are cold. Pretty smart sheets. And they work! I’ve had a number of nights sleeping on them and have noticed I’m not throwing my sheets and blankets on and off throughout the night as I get too hot and then too cold. I’ll admit I don’t exactly understand how the fabric technology all works, but I know I’m getting more restful sleep – and at 9 months pregnant, that’s something I’ll welcome with open arms. • Logic™ Label system takes the guesswork out of where to start making your bed. 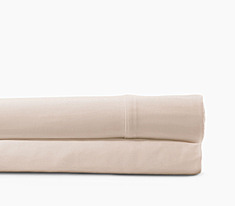 Though the set usually retails for $169.99 – $219.99 depending on size, right now the sheets are on sale for $159.99 – $199.99. Even better, Select Comfort wants to give one lucky MWS reader a set of In Balance sheets in the size and color of their choice. GIVEAWAY Do you sleep with a snorer? Are you pregnant and can’t find a comfortable position? Have a newborn waking you up at night? Always too hot or too cold? To enter, leave a comment with your biggest sleep woe right now. Receive an extra entry by friending Select Comfort on Facebook. Contest ends July 16th at 11:59pm. Open to residents of the U.S. and Canada only. Sorry – no PO boxes. Winner chosen at random. Disclaimer: I received a sample of the In-Balance Sheet set for this review. « Safe outside no matter the weather with Sport-Brella! My biggest sleep woe is we let our tween come in the room once at the beg. of summer and now she’s in their w/us every night, lol. We need to nip it in the bud, but it’s prolly the last year she’ll ever even want to be next to us, lol, so we’re torn. My biggest sleep woe now is the much too warm summer nights! My biggest sleep woe is getting cold at night. This wakes my up at night. My neighbors smoke, and the smell wakes me up. My biggest sleep woe is not having enough time to sleep! My biggest woe is my husband bugging me! He lays over on my half of the bed, shoves his pillow in my face, steals the blankets, and other annoying things. Our biggest woo is temperate control in the summer. Right now my sleep problem is too much heat. Usually it cools down overnight in Colorado, but lately it’s been staying hot. I sleep with just a sheet, but sometimes that’s too much. Thanks for the contest. I don’t sleep much and when I do it feels like I didn’t sleep at all.